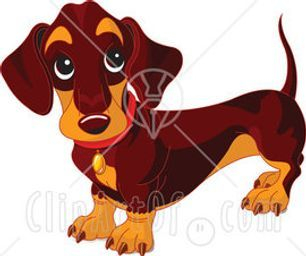 Honeyman's Miniature Dachshunds - How Could You? When I was a puppy, I entertained you with my antics and made you laugh. You called me you child, and despite a number of chewed shoes and a couple of murdered throw pillows, I became your best friend. Whenever I was "bad," you'd shake your finger at me and ask "How could you?" -- but then you'd relent and roll me over for a belly rub. My housebreaking took a little longer than expected, because you were terribly busy, but we worked on that together. I remember those nights of nuzzling you in bed and listening to you confidences and secret dreams, and I believed that life could not be any more perfect. She, now your wife, is not a dog person" -- still I welcomed her into our home, tried to show her affection, and obeyed her. I was happy because you were happy. Then the human babies came along and I shared your excitement. I was fascinated by their pinkness, how they smelled, and I wanted to mother them, too. Only she and you worried that I might hurt them, and I spent most of my time banished to another room, or to a dog crate. Oh, hiow I wanted to love them, but I became a prisoner of love. Now, you have a new career opportunity in another city, and you and they will be moving to an apartment that does not allow pets. You've made the right decision for your "family." but there was a time when I was your only family. You had to pry your son's fingers loose from my collar as he screamed,: No, Daddy! Please don't let them take my dog!" And I worried for him, and what lessons you had just taught him about friendship and loyalty, about love and responsibility, and about respect for all life. At first, whenever anyone passed my pen, I rushed to the front, hoping it was you that you had changed your mind -- that this was all a bad dream...or I hoped it would at least be someone who cared, anyone who might save me. When I realized I could not compete with the frolicking for attention of happy puppies, oblivious to their fate, I retreated to a far corner and waited. I heard her footsteps as she came for me at the end of the day, and I padded along the aisle after her to a seperate room. A blissfully quite room. As is my nature, I was more concerned about her. The burden which she bears weighs heavily on her, and I know that, the same way I know your every mood. If "How Could You?" brought tears to your eyes as you read it, as it did to mine as I wrote it, it is because it is the composit story of the millions of formerly "owned" pets who die each year in American and Canadian animal shelters. Anyone is welcome to distribute the essay for a noncommercial purpose, as long as it is properly attributed with the copyright notice. Please use is to help educate, on your websites, in newsletters, on animal shelter and vet office bulletin boards. Tell the public that the decision to add a pet to the family is an important one for life, that animals deserve our love and sensible care, that finding another appropriate home for your animal is your responsibility and any local humane society or animal welfare league can offer you good advice, and that all life is precious. Please do your part to stop the killing, and encourage all spay and neuter campaigns in order to prevent unwanted animals.